Apparently they don't notify you "hey, you're in EST setting for a location in Japan, do you want this to be Japan time or are you really getting there at 2am Japan time?" Caused me to miss something I was looking forward to. Yes, "if you were looking forward to it, you should've checked" but when you're on vacation, you sometimes trust the computer. I think it's terribly stupid as it should've guessed the time zone, or at least asked, but whatever. Set automatically needs to be turned on in the date & time setting, or you’ll have to change it manually. It set automatically. Myself issue is I set a calendar event with a location in Japan, but Apple didn't think "he probably wants this for Tokyo time not Florida time". Gotcha!!! That’s weird though. My calendar events usually update. I’m not sure why that happened. Right, the issue is that it updated. It didn't realize I set for 11:25am while in Florida, but meant 11:25 Tokyo. The issue is it then adjusted it for Tokyo, and set it the next day at midnight. Seems like you didn’t have a location in the appointment, or at least that’s the only thing I can think of. I did have the location. I didn't pay money for the ticket, was for the Pokemon Cafe in Tokyo, but there aren't any other reservations while I'm here. Not the end of the world. Oh ok. At least you didn’t lose money. I haven’t tried this yet on iOS yet (haven’t travelled with an iPhone). My expectation is that there should be an option as on my Priv to set the time zone for events. From what I know it’ll default to whichever time zone your phone is actually using. I can imagine it gets annoying in the situation where you’re setting calendar events in your local city (say Toronto for instance) for events or things that you need to do when on holiday/vacation/trips. Edit: screenshot added. 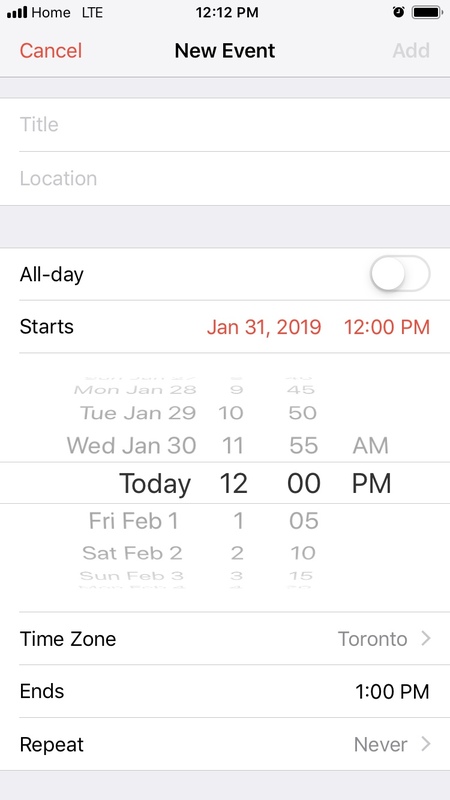 Looks like it’s the same process, time zone can be set within the calendar.